Sauces add moisture and enhance the flavor of whatever dish you use them with and thicker sauces work well as dips or spreads. Remoulade and tartar sauces are two mayonnaise-based sauces often served with seafood. Although the basic sauces are similar, the variations in the recipes create a range of differences in flavor, color and uses. Basic tartar sauce and remoulade contain the same basic ingredients. Both start with a mayonnaise base or, if you're watching your waistline, a mix of mayonnaise and plain yogurt. To this, both recipes add diced pickle and a splash of lemon juice. Dill or other savory pickles are used in remoulade, but tartar sauce usually uses sweet pickles, although it can take dill pickles as well. At this point, the basic sauces can be called complete, but can be varied depending on what you have on hand and your own preferences. From the basic recipe, remoulade and tartar sauce branch off with remoulade having a number of variations. If you prefer a tartar sauce with more flavor, you can add a touch of parsley and chopped onion. A French-style variation on remoulade uses aioli in place of mayonnaise then mixes in classic French ingredients such as Dijon mustard, chervil, chives and tarragon, as well as finely chopped pieces of celeriac and sometimes anchovies. A Scandinavian take on the French sauce adds cabbage, carrots, coriander, turmeric and other spices. Influenced by the French, Louisiana cooks added their spin to remoulade by mixing in celery, tomato paste, cayenne, vinegar and hot sauce. Both the basic tartar sauce and remoulade are thick sauces that are mostly white. When aioli is used, remoulade has a pale yellow color. In the Scandinavian version of remoulade, the turmeric makes the sauce yellow, while the spices and tomato paste of Louisiana remoulade make a red sauce. With sweet pickles added, tartar sauce has the simple flavor of mayonnaise with a touch of sweetness. Basic remoulade also has the taste of mayonnaise, but with a saltier taste due to the dill pickles. The herbs in French remoulade provide a subtle hint of flavor without being overwhelming. In Scandinavian remoulade, the coriander shines. Louisiana remoulade can range from mild to spicy, depending on how much cayenne is used. 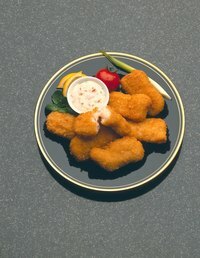 Tartar sauce and basic remoulade are both classic accompaniments to fish dishes, especially fried fish. Remoulade is also used in the Netherlands and Belgium on french fries. With its creamy flavor and herb flavorings, French-style remoulade makes an excellent replacement for plain mayonnaise in potato salad. The spicy blend of Louisiana remoulade makes it perfect for dipping Creole favorites, like shrimp and crayfish, in place of cocktail sauce.